in Grilled, Paneer, Product review, Veg. As I mentioned in my last Post, "Mother's Recipe" has invited me to take part in their "Innovative Recipe Challenge". As a part of this contest, they sent me some of their ready-to-cook products. I've to come up with a recipe with my own twist with that product and also have to blog about my experience. I've already tasted their Chirer Pulao/Instant Poha Mix and created a recipe with it. You can find the recipe here. Thick yoghurt : 2 tblsp. Tandoori Masala : 2 tsp. Besan/Chickpea Flour : 2 tblsp. Dry fenugreek leaves/Kasuri Methi : 1 tblsp. 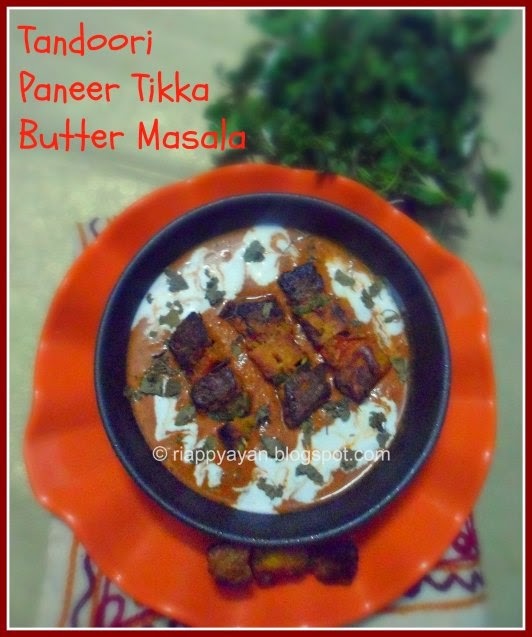 Mother's Recipe Paneer Butter masala : 1 pkt. First marinate the paneer pieces with lemon juice and black pepper powder for 1/2 an hour. Meantime, prepare the second marinade, mixing rest of the ingredients in another bowl except oil. After 30 minutes of first marinade, marinate the paneer, capsicum and tomato pieces with second marinade and keep aside for 45 mins.-1 hour. Now arrange paneer, capsicum and tomato pieces alternately in a skewer or in a toothpick, I didn't have skewer, so I did in a toothpick. Then place these toothpicks on a greased baking tray, drizzle little oil on every skewer and grill them for 20 minutes on both sides. When top part is done, flip and grill for another 15-20 minutes or top part has browned well. Your Tandoori Paneer Tikka is done. Now prepare the Butter masala gravy according to package direction. Before removing from heat, add fresh cream and dry fenugreek leaves/kasuri methi. Mix for couple of minutes and remove from heat. 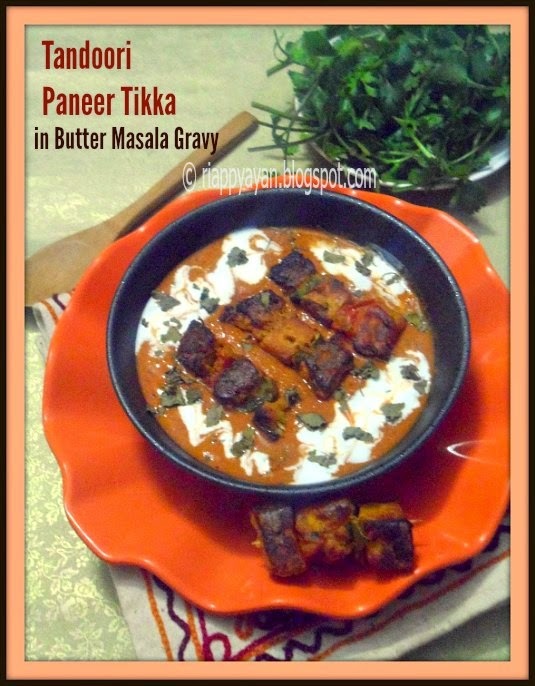 Just before serving, serve butter masala gravy in a bowl, then dunk Tikkas into the gravy. Serve. Here is how I prepare Paneer Butter Masala at home. The butter masala gravy was quite delicious. My daughter is a paneer lover, she loves panner in any form. She specially loved the gravy and the idea of paneer tikka in it. I'll recommend everyone to try this Paneer Butter Masala at least once. Labels: Grilled, Paneer, Product review, Veg.